Let's face it, electronics are becoming used at a younger and younger age with all of the computers and other devices that are available. So, of course little ones want something of their own, as they see their older siblings and friends with their devices. We found this FunTab Kids Tablet and thought that it would be a decent idea, as sometimes they are still too young for a lot of the other things. The Ematic FunTab Pro Tablet comes preloaded with the award winning Zoodles Kids Mode, giving your child access to a variety of educational games and content. The kid safe interface adapts to your child's age and skill level and allows parents to monitor their learning. The ergonomic shape allows a secure and comfortable grip for your child. The Parent dashboard enables you to track your child's learning progress while customizing the games and content to meet their needs. Thousands of fun, educational games are included that are always changing so your child never gets bored. Educational videos focused on a variety of fun topics, like dinosaurs, counting, geography, and more. HDMI mirroring allows your children to view their favorite games, books, and videos on your TV. Kids can create their own unique drawings without mess or hassle with the Art Studio feature. All drawings are automatically saved to an art gallery where you can easily share them with friends and family. Encourage a fondness for reading and writing by giving your children digital storybooks where you can record your own special reading for your child to enjoy. 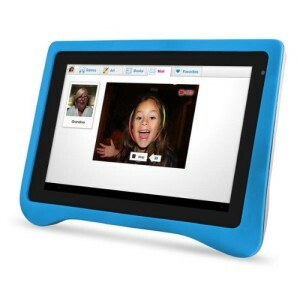 Video mail lets your child stay in touch with family members far away. iStory Books feature interactive books that read themselves while your child follows along. Includes classic stories such as Cinderella, Little Red Riding Hood, and Three Little Pigs. Includes popular games such as Angry Birds, Where's My Water?, Cut the Rope, and more. Front and back cameras. There are different kids devices available on the market that have educational and fun game play capability. We liked this tablet because for one it was fairly affordable, and it is also very portable, meaning that our child could take it with them whenever they went on errands with us, or on a family trip somewhere for use in the car. One of the features that really stuck out to us with this device is that it is totally kid safe. Although they can surf the internet with it, they can only go to the sites that parents allow, which of course is perfect. In fact, there is a whole parent dashboard that you can use to track your child's learning progress plus customize the content and games to meet his needs. There are all kinds of activities your child can do on this tablet to keep them busy and learning, including drawing, educational games and storybooks.